This is a good time to go get a Happy Meal at McDonald's. Your toy will be a package of THREE little plastic DC Comics characters looking the way they appear on the Batman/The Brave and the Bold cartoon show (which is to say they are slightly bigfoot). On my first visit I got a sort of Batman-Robot and an Aquaman and a Black Manta. The second trip garnered a wings-akimbo Batman and a Tim Drake Robin and a quite-excellent Gorilla Grodd. It seems the pattern is to get two heroes and one villain in each three-pack. Be sure to ask for a boy's Happy Meal though or you will get something called Madame Alexander toys in the girl's Happy Meal. (Don't they think girls like comics?) You can find a more scholarly dissertation about these toys at this link. 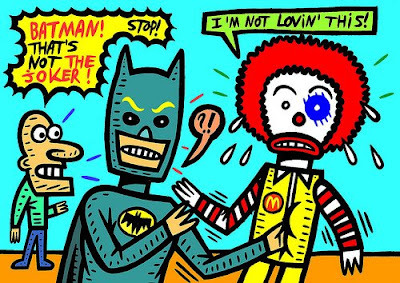 By the way, I came across the fun Batman and Ronald drawing above at Bat-Blog.com which you can visit by clicking here. Whoops. I went today to get another three-pack so I could report whether the pattern of one-villain-and-two-heroes-one-of-which-was-a-Batman-figure would continue. I reached into the Happy Meal box and pulled out (drum roll please) some monkey figure from Kung Fu Panda! (Can you believe this hayfamzone timing? I guess I came late to the party and the day after I tell you to go get the Bat toys they are no longer gettable.) Just about the last thing I need on this earth is a Kung Fu Panda toy so I gave it to a family at the next table and they seemed to be having quite a bit of fun with it when I left. That is so darn funny and cute! Especially the "I'm not loving this."